Alex Box was an outstanding LSU athlete whose wartime gallantry would earn him the Distinguished Service Cross but would ultimately cost him his life. Simeon A. "Alex" Box was born in Quitman, Mississippi on August 5, 1920. His father, Sam, was a machinist and worked in a lumber mill. The family moved to Laurel around 1933, and he attended George S. Gardiner High School in that town. A naturally gifted athlete, he was all-state in football, and state champion in the 100- and 200-yard dashes and the discus throw. Alex also played on a semi-pro baseball team put together by the Masonite sawmills company and attracted interest from the Cincinnati Reds before accepting a football scholarship from Louisiana State University (LSU) in 1938. Box, a handsome and popular figure on campus who majored in petroleum engineering, played wingback on the football team but the disclocation of his shoulder in a game against Holy Cross in 1939 ended his football career. Turning to baseball in his sophomore and senior years, he played right field and batted in the cleanup position. On occasion, his shoulder would dislocate on his throw from the outfield. The infielders would go out and pull it back in place, and he would stay in the game. During this time he met Earle Hubert, an attractive young student from Plaquemine, Louisiana, and they developed a close relationship. Box pursued his advanced ROTC studies at LSU in the engineering regiment and upon graduation as a lieutenant early in 1942 he entered the Army. Box took basic training with the 1st Infantry Division at Camp Blanding, Florida and completed training at Fort Indiantown Gap, Pennsylvania. During this time Alex and Earle agreed to marry when she completed her degree, but on August 2, 1942, Box left the USA bound for Britain. Based at Tidworth Barracks and serving with the 1st Engineer Combat Battalion of the 1st Infantry Division, First Lieutenant Box continued training until November 1942, when the entire division aboard 22 ships, left England bound for North Africa. Operation Torch was the Allied invasion of North Africa. For the 1st Infantry Division, their job was to overcome the Vichy French forces at Oran, Algeria. On November 7, the division disembarked at Oran and met with determined resistance. The 1st Engineer Combat Battalion's primary role was of road maintenance and mine warfare. It's secondary role was fighting as infantry. It was in this role on November 9, 1942, at Arcole, Algeria, that Lieutenant Box - a platoon leader - used a half-track to destroy enemy machine guns emplacements that were blocking the 1st Infantry’s advance. For his extraordinary heroism he was awarded the Distinguished Service Cross - the second highest military decoration of the US Army. The following year Alex was fighting German forces in Tunisia. In February 1943, Field Marshall Rommel launched an all-out attack against the American forces at Kasserine. Alex Box was involved in laying minefields and preparing road blocks, when, on February 19, a mine was accidently discharged. He was killed instantly, along with four other soldiers. He is buried at Plot I, Row 5, Grave 1 in the North African American Cemetery in Carthage, Tunisia. "The deeds and death of your son have gone to make up the spiritual background that is this country," wrote Brigadier General Theodore Roosevelt - at the time second in command of the 1st Infantry Division - in a letter of condolence to Box's mother, Mattie Box. R.H. Watkins, superindent of schools in Laurel, Mississippi, eulogized Box as a "perfect example of an athlete, a Christian gentleman, a scholar and a soldier ... His beautiful life may be compared to a great piece of music which ends on a high note." In May 1943, the LSU Board of Supervisors voted unanimously to name the university's baseball stadium for Box. "For the first time in the school's history," observed the student newspaper, The Reveille, "the service and memory of the military hero came to be esteemed so highly that a structure on the campus was named in his honor." 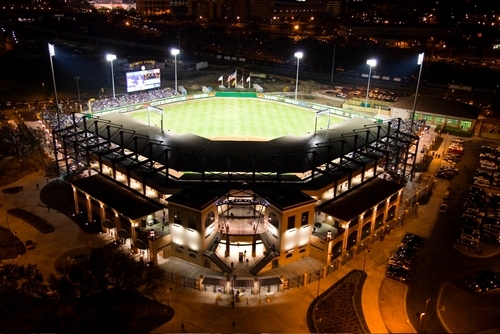 The LSU Tigers baseball team continue to play at Alex Box Stadium today. In December 1943, the flagpole quadrangle at Laurel Army Air Field was renamed "Alex Box Quadrangle" in his honor. Lieutenant-Colonel Harrison W. Wellman, Jr., base commander, made the dedicatory address with members of the Box family in attendance as honored guests. In 1991, the Box family made a special presentation of his personal memorabilia to LSU. The items, enclosed in a specially-constructed glass case, are permanently housed in the LSU Athletics Hall of Fame and Museum. 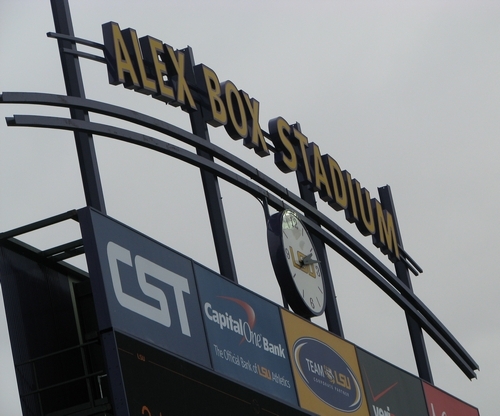 In 2009, the state-of-the-art New Alex Box Stadium was opened, ensuring that the name of LSU’s WWII-baseball hero lives on for many years to come.
" ... on November 1942, near Arcole, Algeria, Lt. Box distinguished himself by extraordinary heroism in action against an armed enemy. When the advance of his battalion and an attached artillery battalion was stopped by determined antitank, machine gun and small arms fire on the outskirts of Arcole, Lt. Box without hesitation, of his own voliation and at the risk of his own life, volunteered to go forward ... in a half track vehicle ... overran and destroyed with hand grenades two strong enemy machine gun positions flanking the road. Then proceeded through the town machine gunning all resistence encountered and returned through severe machine gun fire and rifle fire to the immobilized column. It was the bold action of Lieutenant Box which contributed largely to the withdrawal of the enemy ..."
Thanks to LSU baseball publicist, Bill Franques, for help with this biography.